Legal Services of Eastern Michigan makes its mission to use legal skills and advocacy to address the causes and effects of poverty. If you are seeking legal assistance we may be able to help, please contact the Counsel and Advocacy Law Line at 1-888-783-8190 to conduct an intake. If you need to talk to a member of our staff, please call our offices at 1-800-322-4512 between 9 a.m. and 5 p.m., Monday through Friday. For legal help, you may be interviewed by phone when you call, or advised to come in for an in-person interview, or asked to leave your name and number so that you can be called back when an intake advocate is available. Please have all documents relating to your legal problem available at the time of your first interview. If you need special accommodations to access our services, let us know how we can help you. Our mission is to use legal skills to address the causes and effects of poverty. Special emphasis is placed on those issues that affect survival needs of low-income people. LSEM delivers free legal help in 14 Mid-Michigan counties, Arenac, Bay, Clare, Genesee, Gladwin, Gratiot, Huron, Isabella, Lapeer, Midland, Saginaw, Sanilac, St. Clair, and Tuscola. At LSEM we offer service from three offices - one in Flint, which also serves as the administrative office, one in Saginaw, and one in Port Huron as well as home visits to the homebound and elderly. 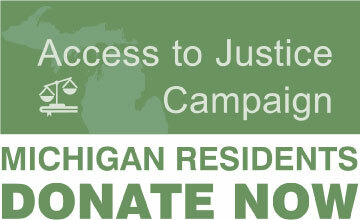 You can help expand access to justice through free legal assistance! Click a link below to get to LSEM's donation page! If you prefer to donate directly to LSEM by mail, please CLICK HERE for the pledge form. To request additional information about donating to LSEM, please contact our Development Director, Attorney Andrea Rossi at (800) 322-4512 extension 113.